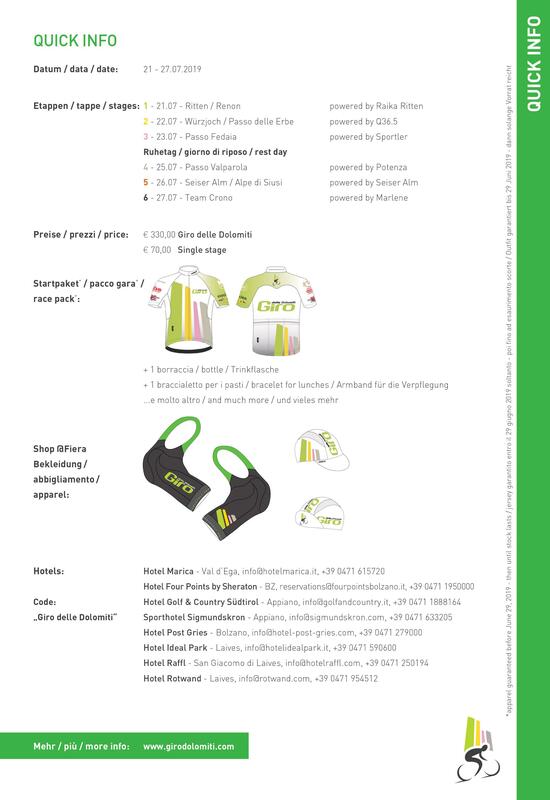 Founded more then 40 years ago, the Associazione Sportiva Dilettantistica Giro delle Dolomiti / Dolomiten Radrundfahrt, a non-profit association, has hosted every single year this unique weeklong cycling experience. 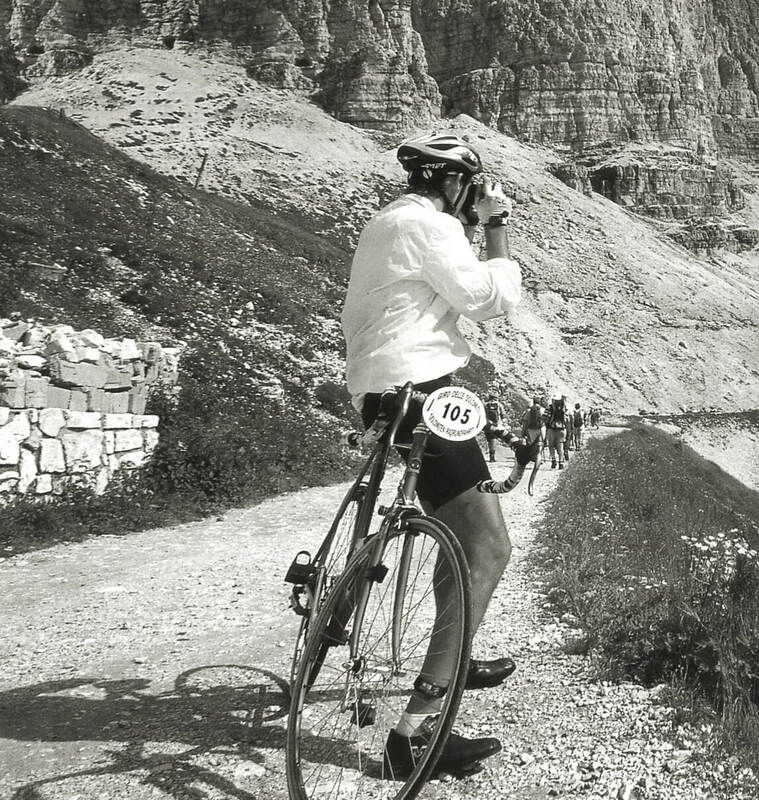 Tens of thousands of people have over those years joined our Giro delle Dolomiti and enjoyed fantastic rides through our timeless mountains. Have you ever ridden though Merano? 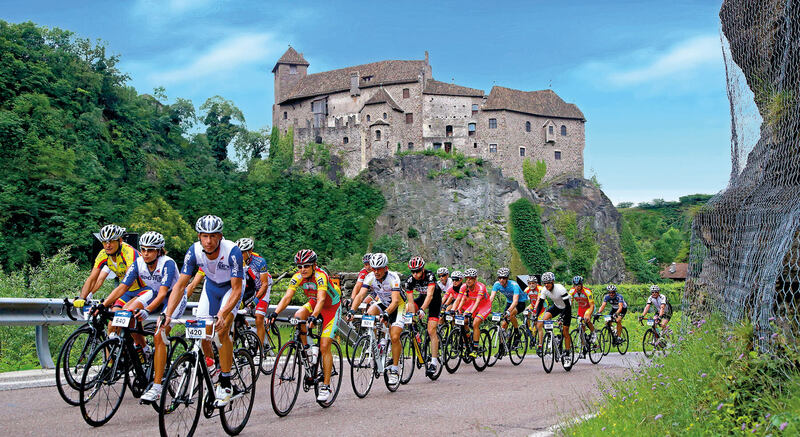 Have you ever done part of the Otztaler Marathon? 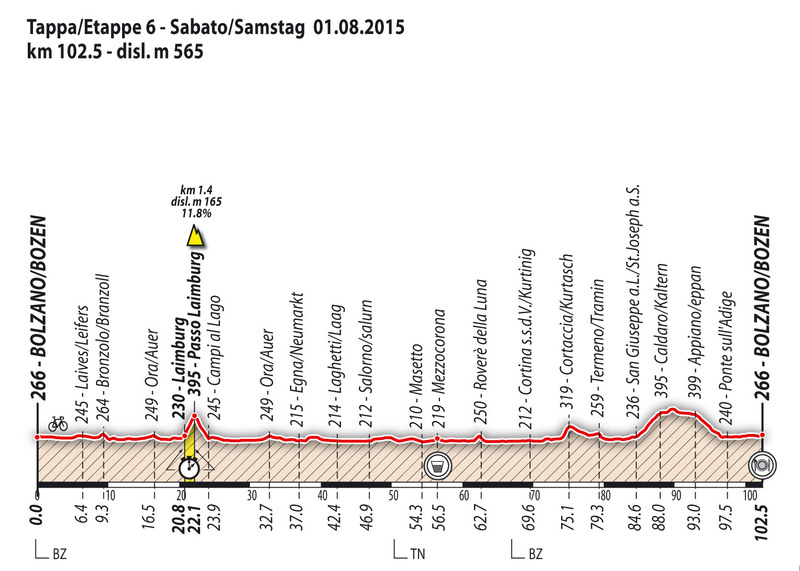 We will do that after about 30km from Bolzano of flattish roads. 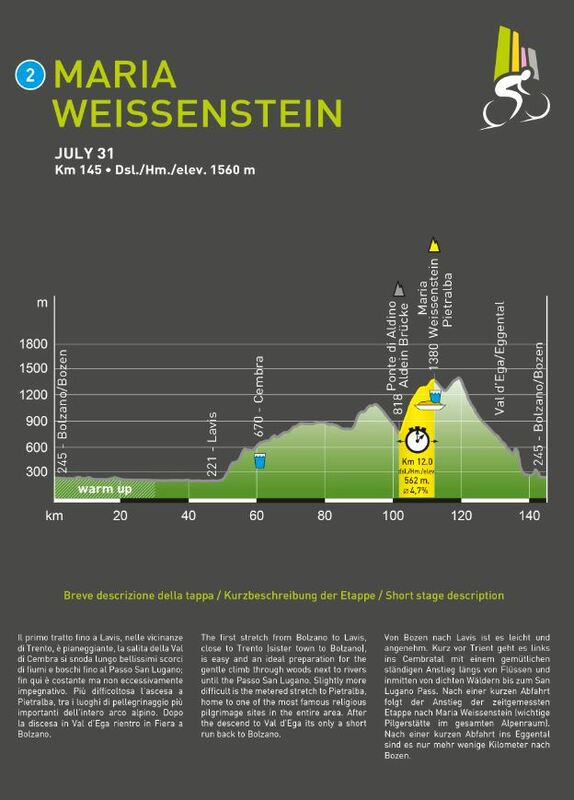 We then start to climb very gently until we reach St. Leonhard in Passeier where the timed stretch begins. 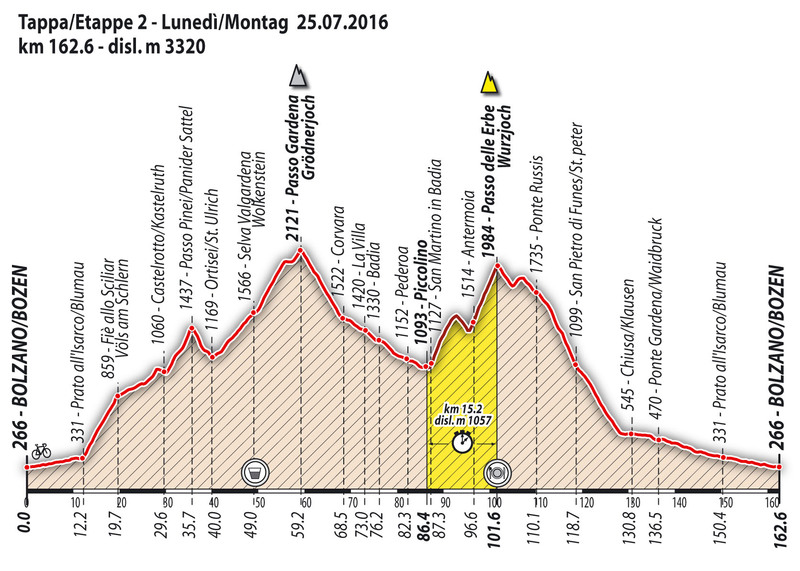 The Jaufenpass is a very long and occasionally steep – a reminder to ask ourselves why we do all this. However, almost up on the peak you will be enjoying an amazing view. Once over the pass, we drive past Vipiteno and Bressanone to Bolzano. 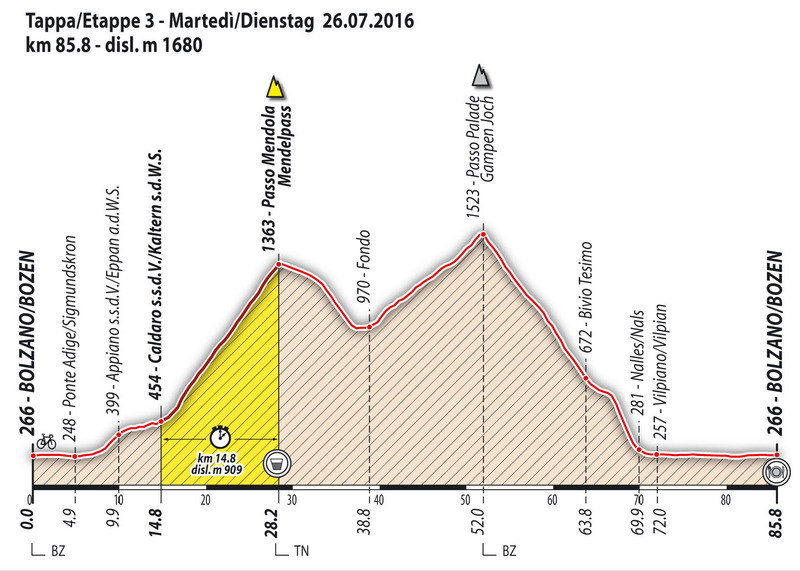 Right after Bolzano we start climbing through the Val d’Ega. It’s a beautiful, however sometimes claustrophobic valley which takes us to Rauth where the timed stretch starts. The climb so far was gentle but it’s now that the tough part starts. For about 3km we climb at more then 12% until we see on our right the basecamp of the skislopes. Then it starts to flatten until the peak. Once passed over, we need to climb the Lavaze still before going back to Bolzano via the Val d’Ega at about lunchtime. 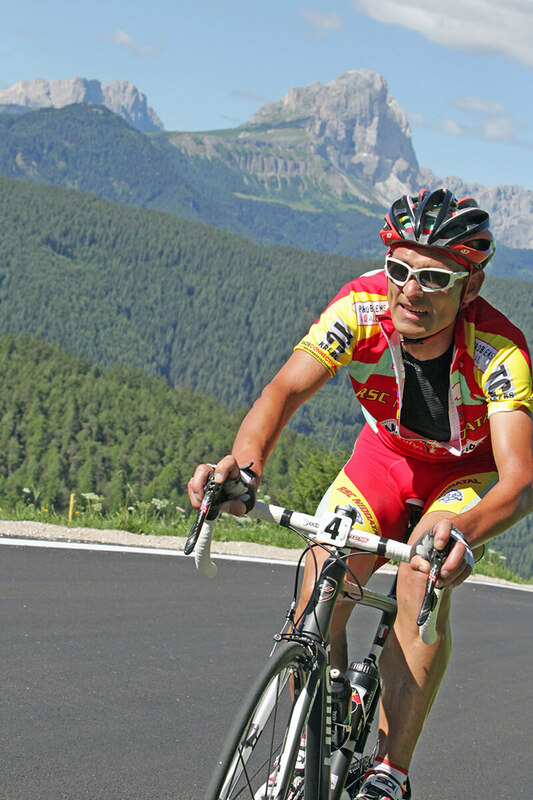 It is surely the highlight of the Giro delle Dolomiti. The length, the altitude, the beauty of the scenery make it unique. 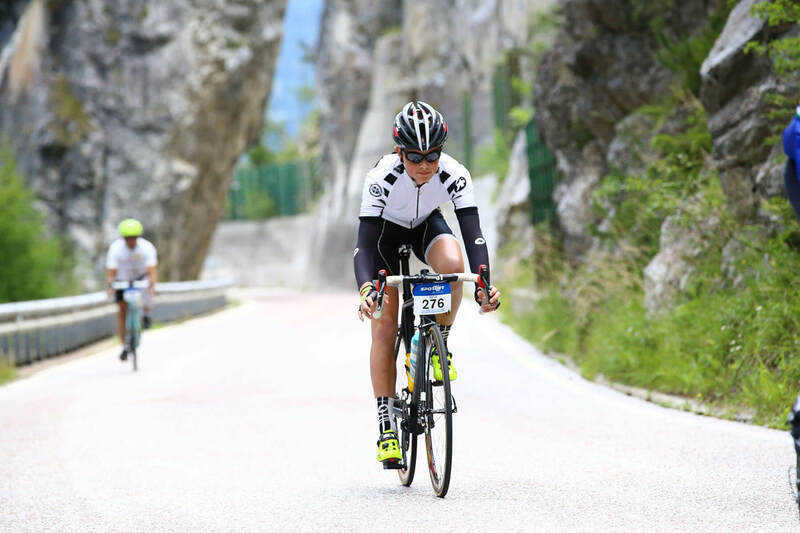 Starting and ending in Bolzano is a long ride, and knowing that the day after there’s plenty of time to recover (Rest Day), we stroll through the Valle Isarco, entering from there the Val Gardena. 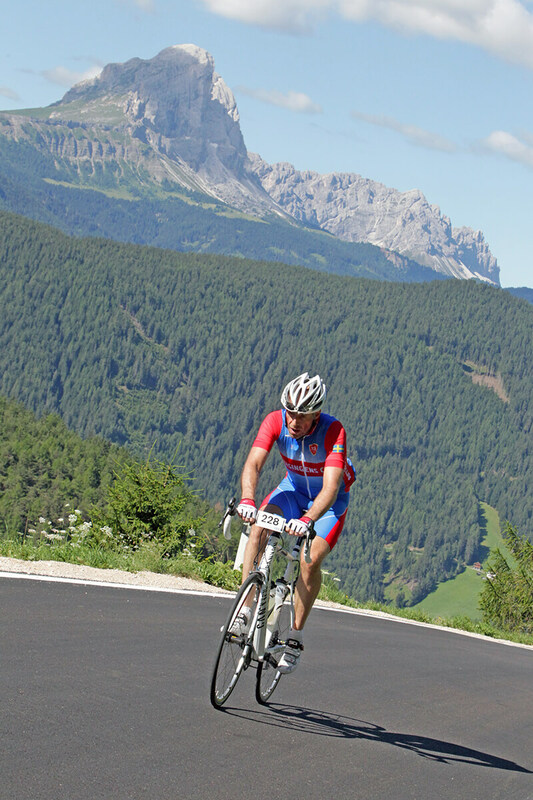 Hopping over the Sella in a gentle pace and the Pordoi thereafter, its being and staying on high altitude that the Giro does not seem that long. 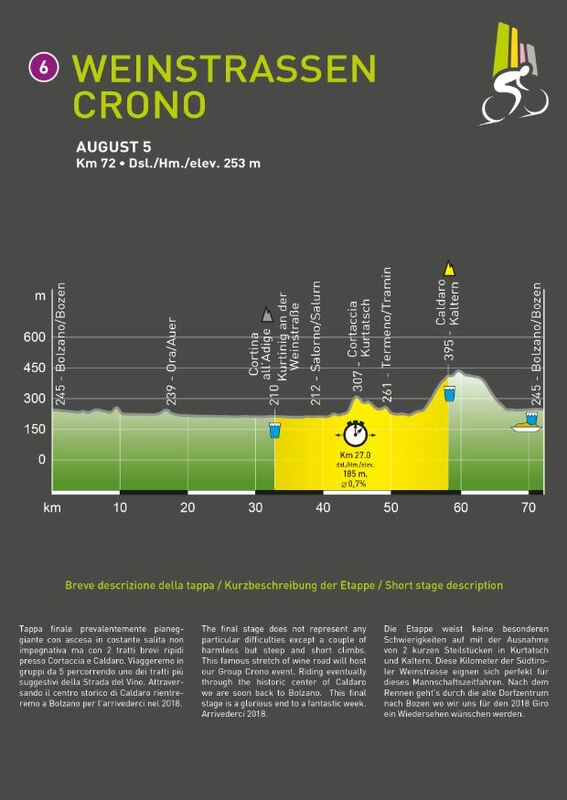 In Corvara we start the timed stretch which will take us to the Passo Gardena in probably less then 1h, or a bit more. Surely, the overall gentle climb (there are a few steep exceptions though) and the scenery make the pain more bearable. 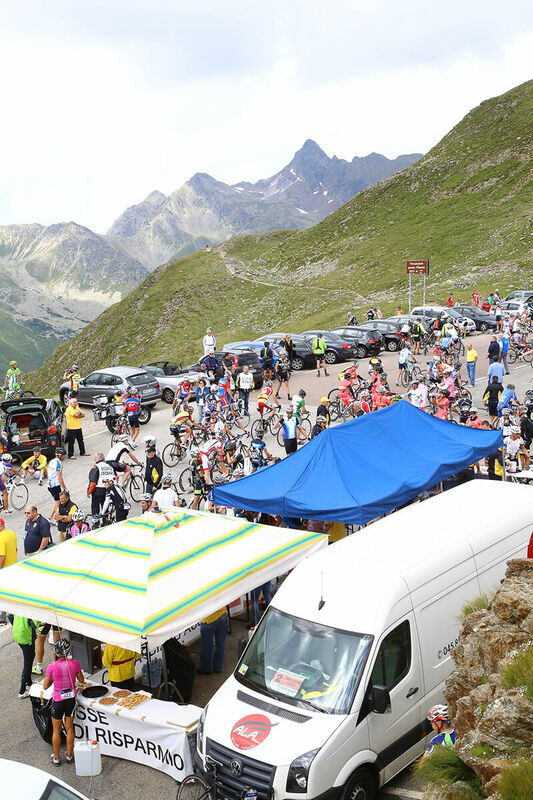 The Giro d’Italia has climbed many times the Stelvio. The Stelvio is a must-do for every cyclist and doing it w/o traffic is a unique proposition. At almost 3.000m altitude the Stelvio can be a surprise to many. Weather conditions can change rapidly and the 48 hairpins to the peak are a tough climb as not even the turns do allow resting time for the rider. The timed stretch starts from the beginning and goes first to Gomagoi, then to Trafoi and finally to the Franzenshöhe where the peak can already be seen. 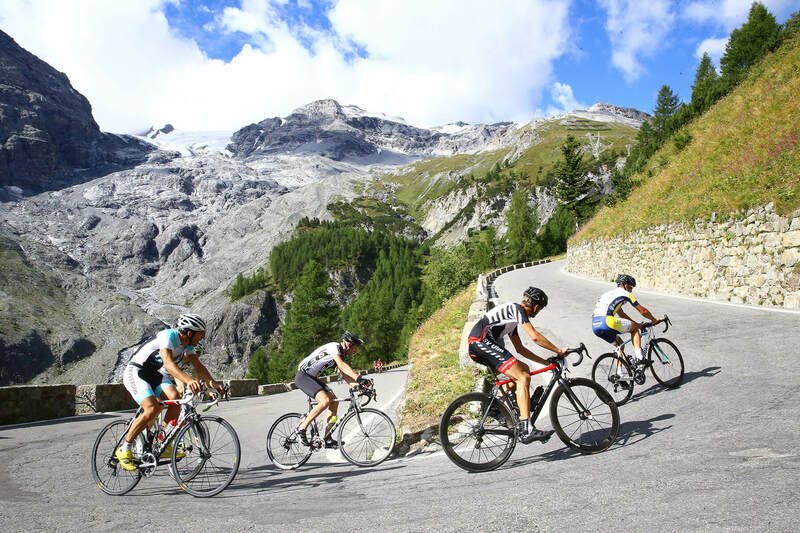 Once over the top we cycle through Switzerland back to Prato allo Stelvio – always downhill. Don’t forget your passport. Its a short tour but a beautiful setting. 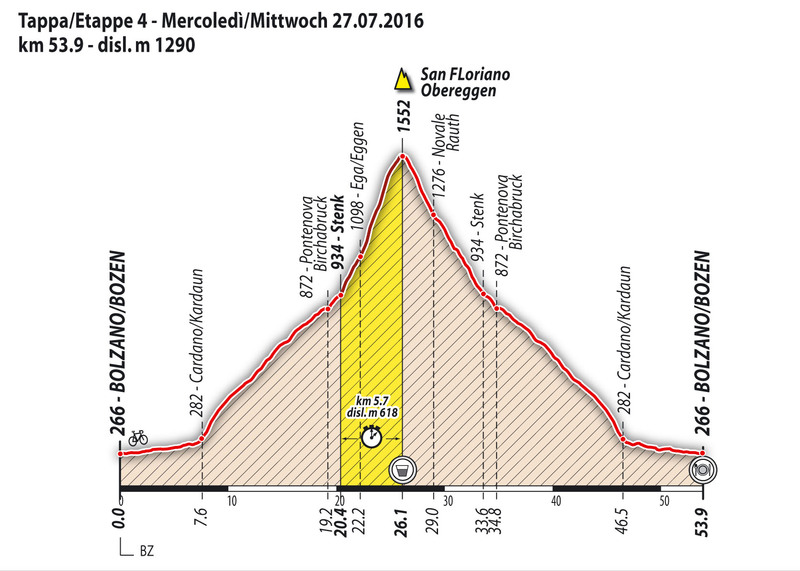 Starting from Bolzano it is a not-so-easy climb to Fiè. 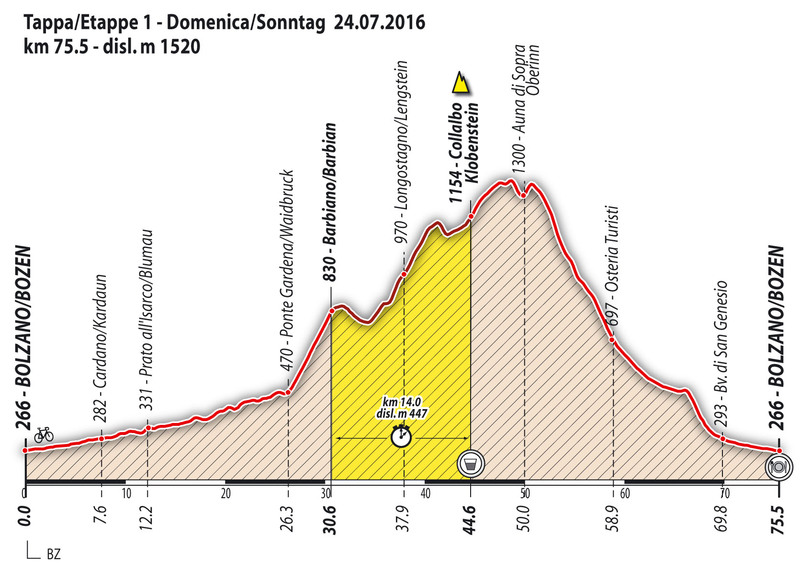 However it’s only 15km from Bolzano therefore there’s plenty of strength in our muscles leading us to Siusi where the timed stretch starts. 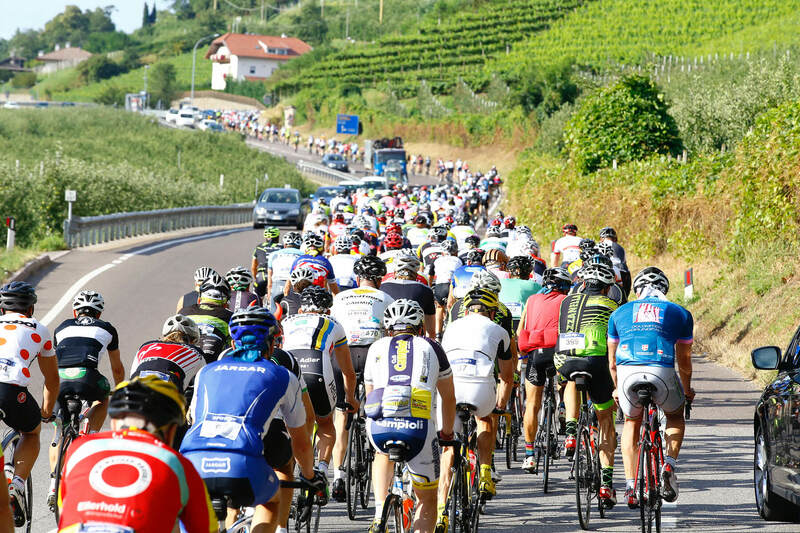 The Giro did it a few times – we do it in our own pace. Climbing through hairpin turns, we are at the top of the mountain in a strikingly beautiful scenery, enjoying a 360-degree photoshoot. We ride back to Bolzano via Ponte Gardena for lunch. Alone or in a group. Last year’s winners group were an assembled group of 4 nations which met during the Giro! That’s exactly the spirit of the last day. 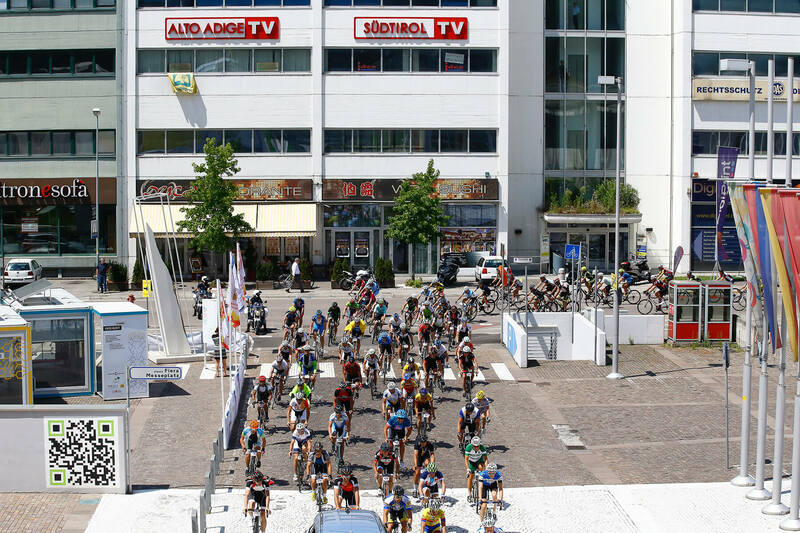 It is a joyful final race event, that’s why also slipstream riding is fine. Your time will be taken, it does not matter if riding individually or in a group. Your time will count towards your overall individual standing. But being a flat course, probably riding in a group will makes you faster. 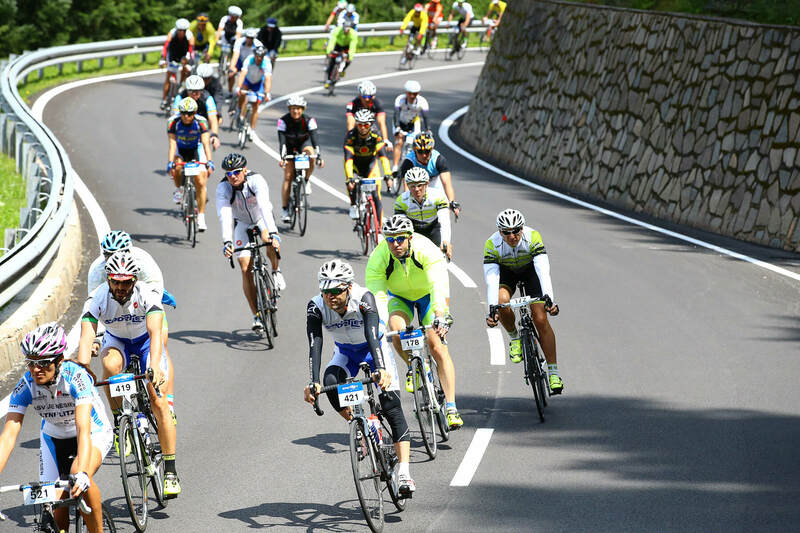 Its easy pedalling from Bolzano to Bressanone on good road conditions. 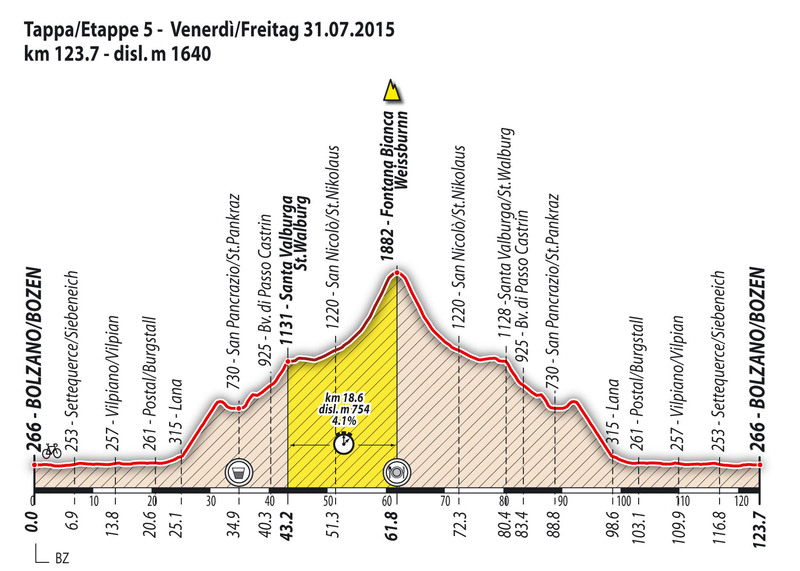 After riding through the historic town of Bressanone we start to climb for about 5km before starting the corn. 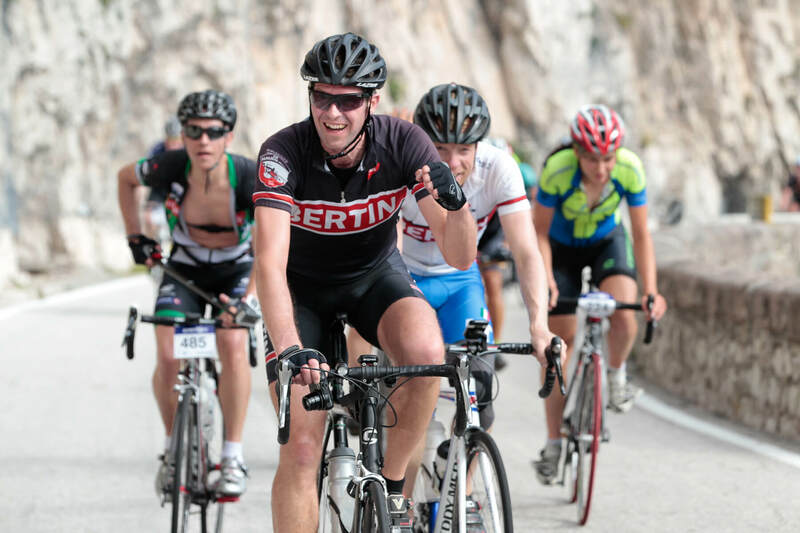 Always climbing until the Plose peak with difficulty grade topping 12% we will finally admire a fantastic picturesque view onto the Dolomites. 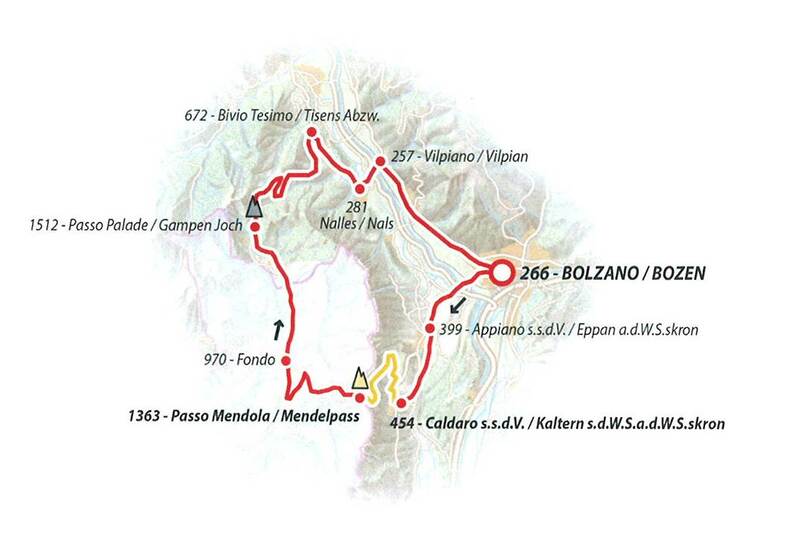 The return to Bolzano is initially steep and narrow but from Chiusa to Bolzano the road is good and easy. 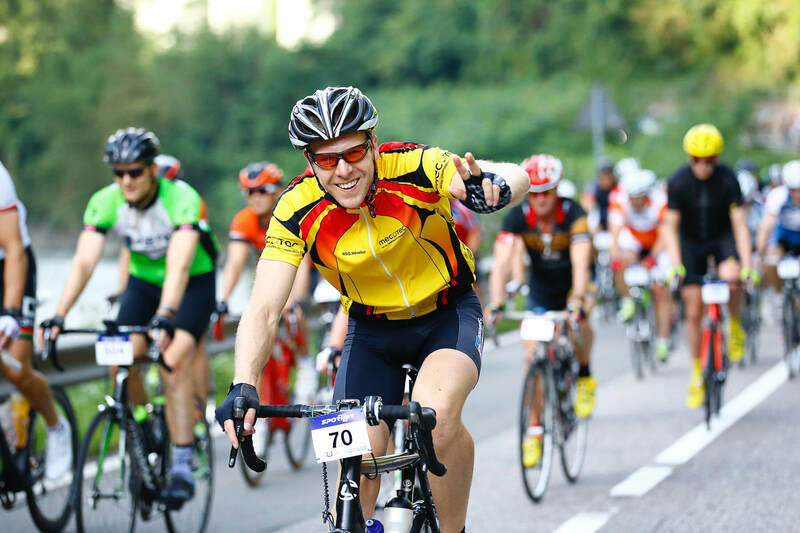 The first stretch from Bolzano to Lavis, close to Trento (sister town to Bolzano), ist easy and an ideal preparation for the gentle climb through woods next to rivers until the Passo San Lugano. Slightly more difficult is the metered stretch to Pietralba, home to one of the most famous religious pilgrimage sites in the entire area. After the descend to Val d’Ega its only a short run back to Bolzano. 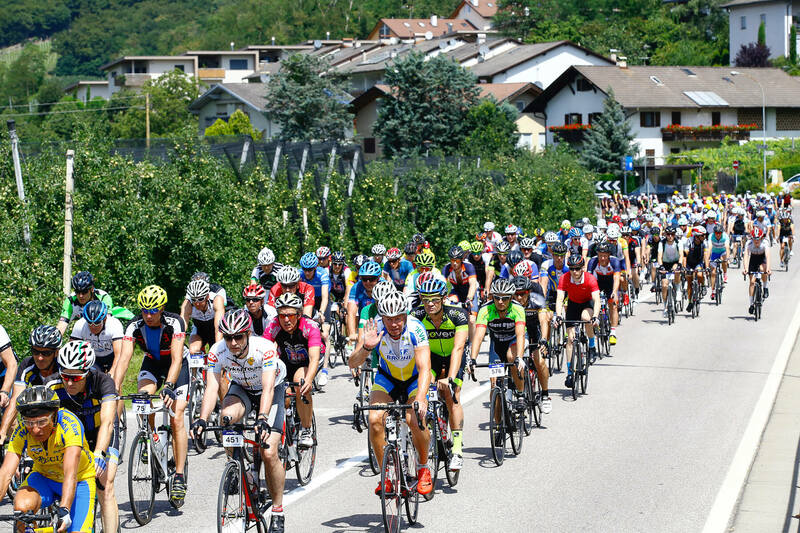 After the easy San Lugano Pass we cycle all together to the town of Predazzo, the beginning of the timed stretch. 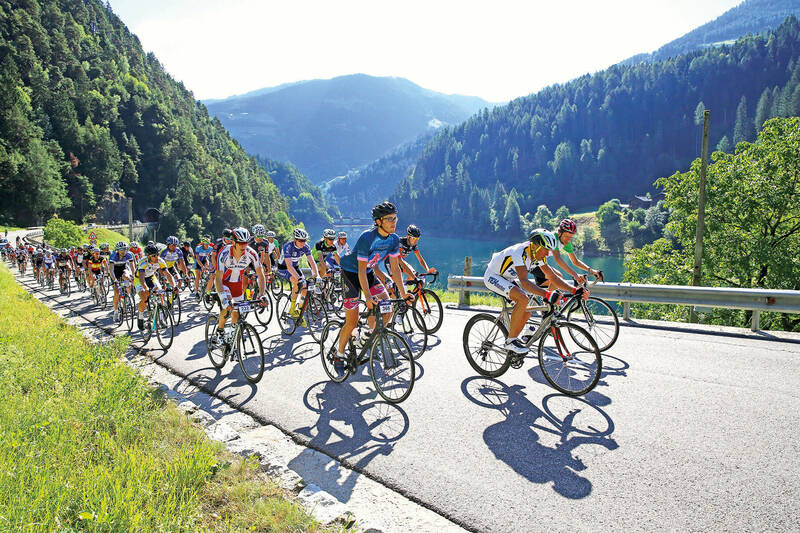 Passt Valley has been several times one of the stages of the Giro d’Italia and is home to the Paneveggio National Park. After a quick and steep descend we climb the Passt San Pellegrino with short stretches of more then 15%. 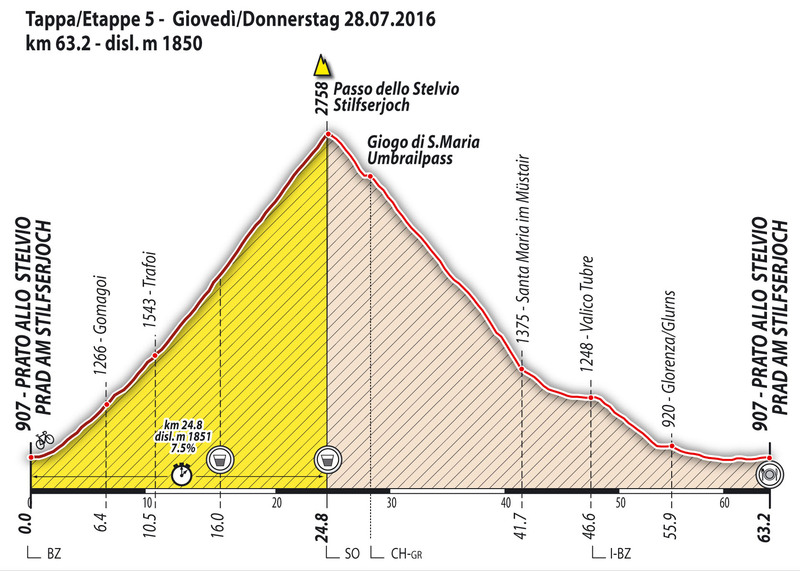 The final easy climb to Passo Costalunga takes us back to Bolzano. 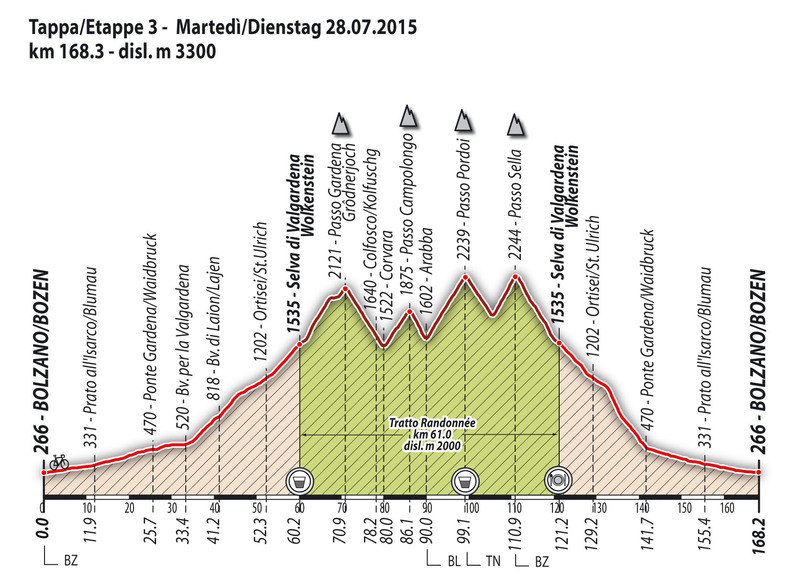 Its an easy ride from Bolzano to Bressanone after which a 4km climb will see sweatpearls for the first time. After arriving in Vipiteno we start a very long, steep but equally beautiful climb to the Passo Pennes. Its views are simply breathtaking. Finally cycling through the historic Val Sarentino we are already on our way back home. Starting at the Fiera we climb shortly thereafter beautiful but steep turns to Collepietra, pedalling then through the wood to Nova Ponente from where the climb to the Lago di Carezza starts. A fantastic view of the Rosengarten will stay with us for many kolilometers. After a refreshment we cycle over the Passo Nigra to Fie‘ and from there to Castelrotto where a median steepness of 10% is our timestopped stretch for the day. Bypassing Val Gardena we drive back to Bolzano. 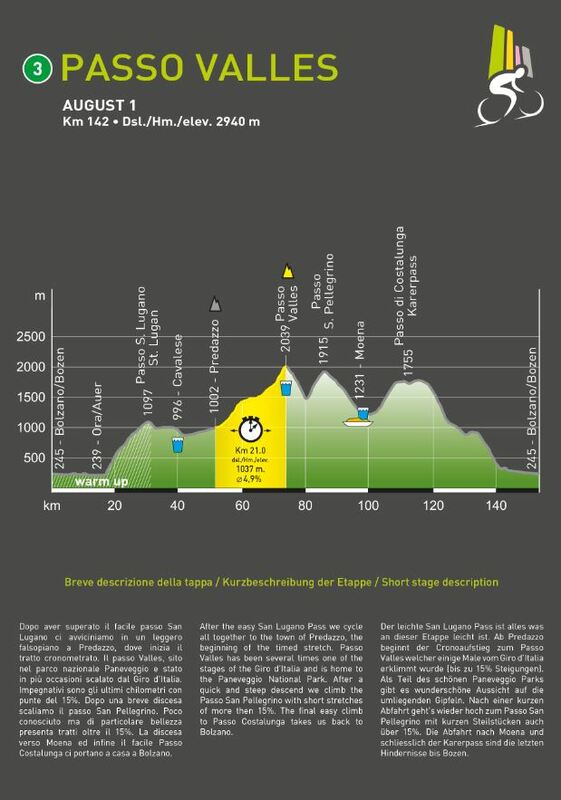 The final stage does not represent any particular difficulties except a couple of harmless but steep and short climbs. This famous stretch of wine road will host our Group Crono event. Riding eventually through the historic center of Caldaro we are soon back to Bolzano. This final stage is a glorious end to a fantastic week. Arrivederci 2018. The timed stretch begins after leaving Barbiano with a descent about 3 km long on a narrow road. 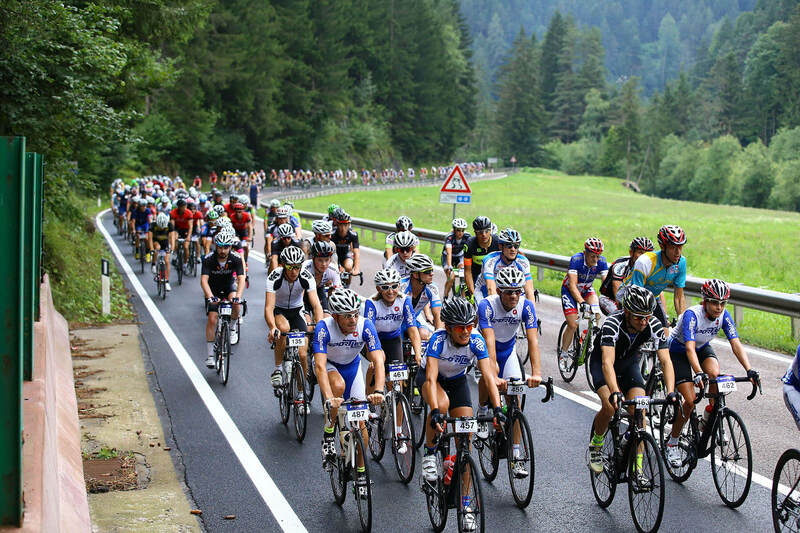 Cyclists go down from 800 m of the start as far as 400 m of Santa Verena. 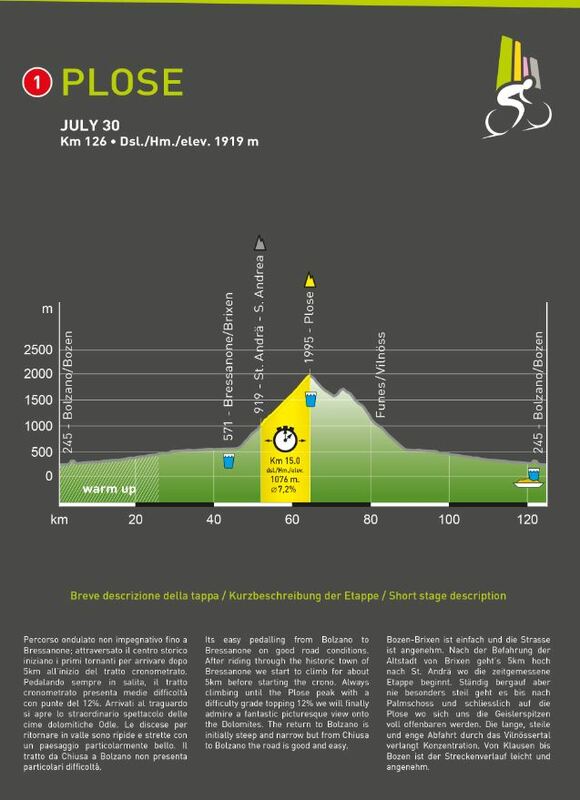 From hier winds the ascent up to Maria Saal (1100 m), where begins a flat stretch, that goes, with some short ascents, to the finish (1154 m). Very demanding ascent, with a length of about 15 km and a difference in height of 904 m, that becomes of about 1100 m, if we consider the descending stretch, 3 km long, that from a height of 1481 m goes down to 1290 m. From here the road goes up to Antermoia (1515 m) and then to Passo delle Erbe (2004 m). 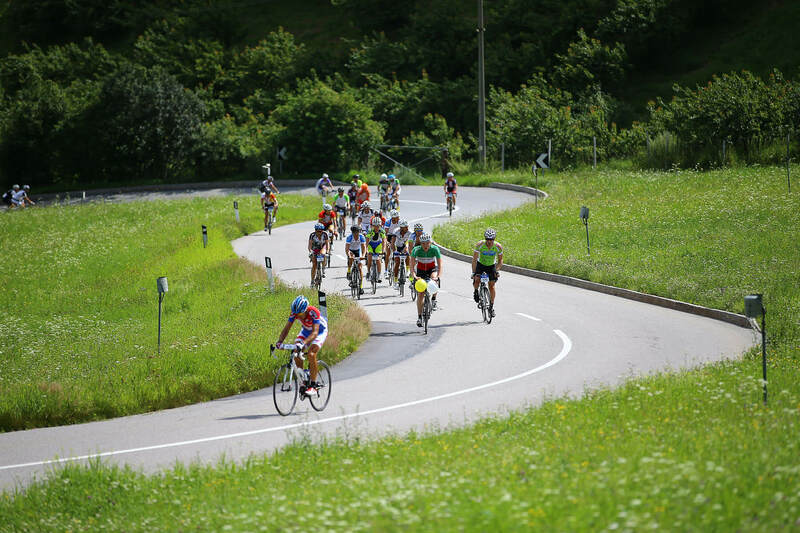 During the descending stretch it is convenient to take a breath, because in the last 6 km the road climbs with steep hairpin turns without a pause (the average slope is 10% with peaks of 12%). The roadway is narrow, especially after the center of Antermoia; the route is mostly shadowy, even if long stretches are facing east, therefore are sunny. 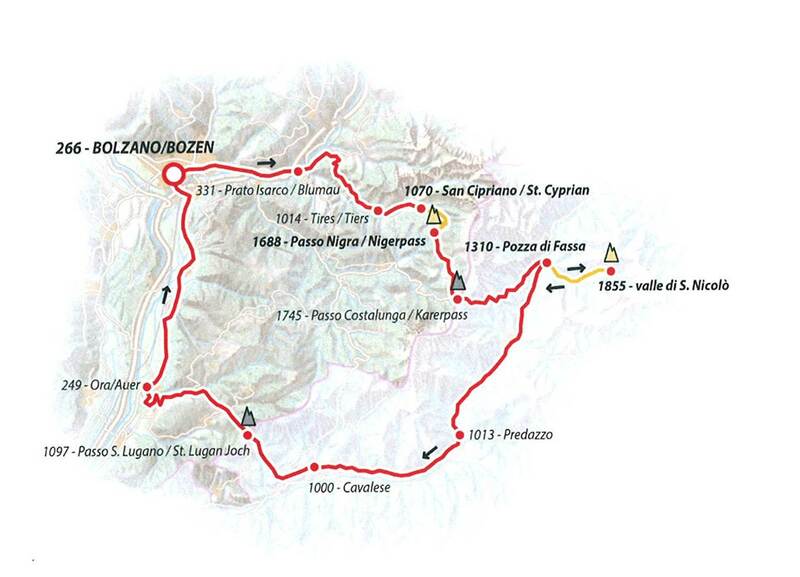 Ascent with a length of 14,8 Km and a difference in height of 909 m with 15 hairpin turns; the average slope is 6,5%. 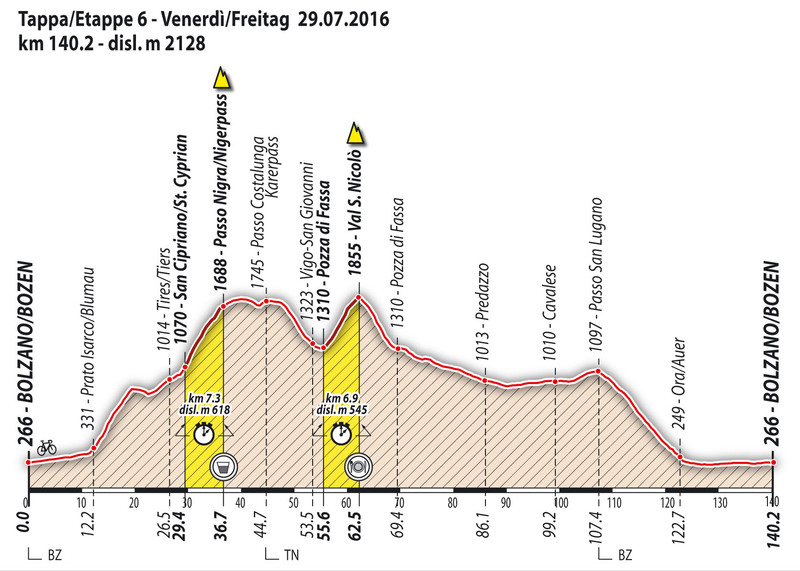 The first 8,2 km as far as the 6th hairpin turn have a slope between 5,5% and 7%, with an average slope of 6.2%. After the 6th hairpin turn begins a difficult stretch about 1,3 km long, with an average slope of 7,9% (maximum 9%). 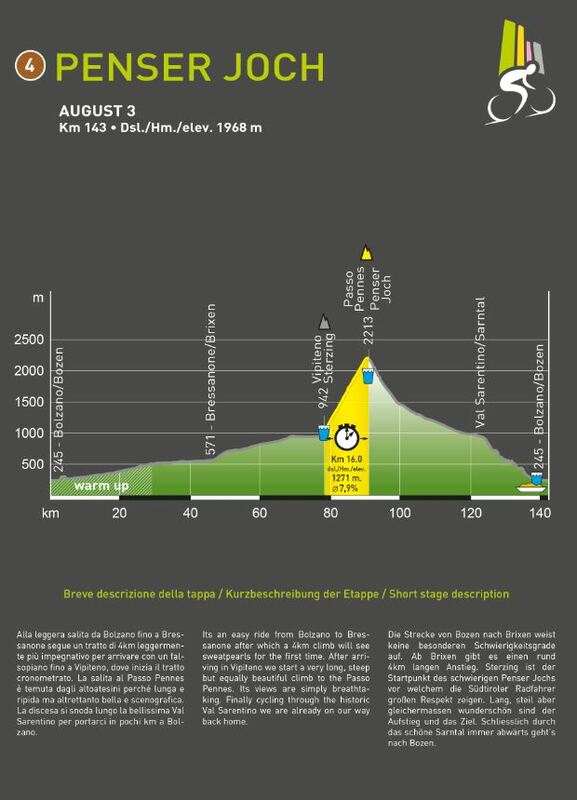 Then the ascent goes on for 2 km to the 7th hairpin turn with an average slope of 6,9%. 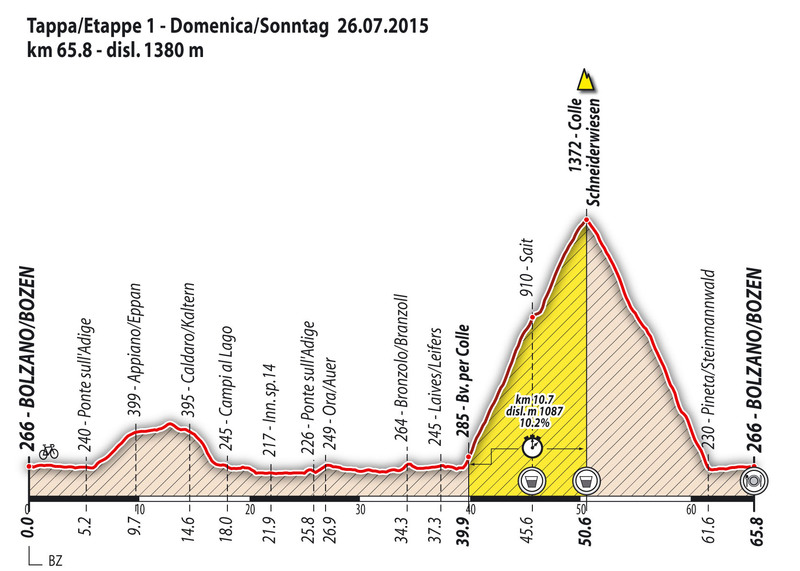 The final stretch (from 7th to 15th hairpin turn) is 2,35 km long and still has an average slope of 6,9%. 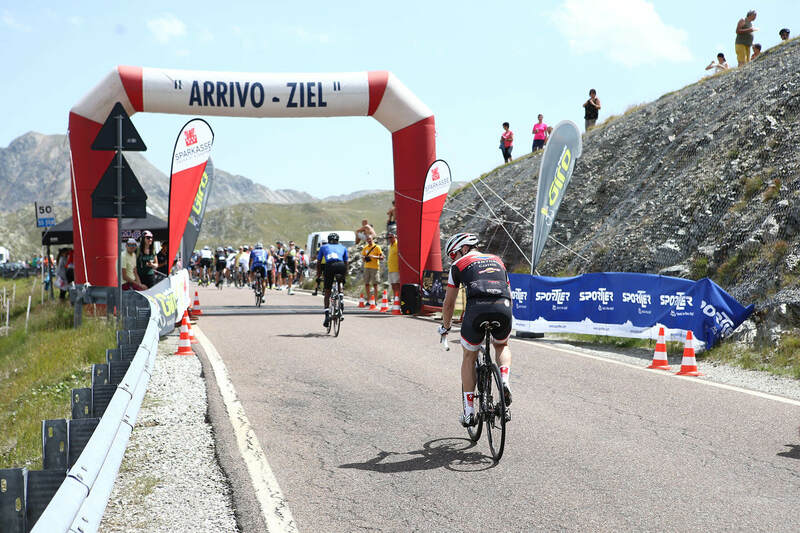 Exceptionally this year, on the occasion of the 40th Giro delle Dolomiti, on Wednesday, usually rest day, will take place an additional and special stage, in order to celebrate the anniversary, with attribution of the “40TH ANNIVERSARY” TROPHY. 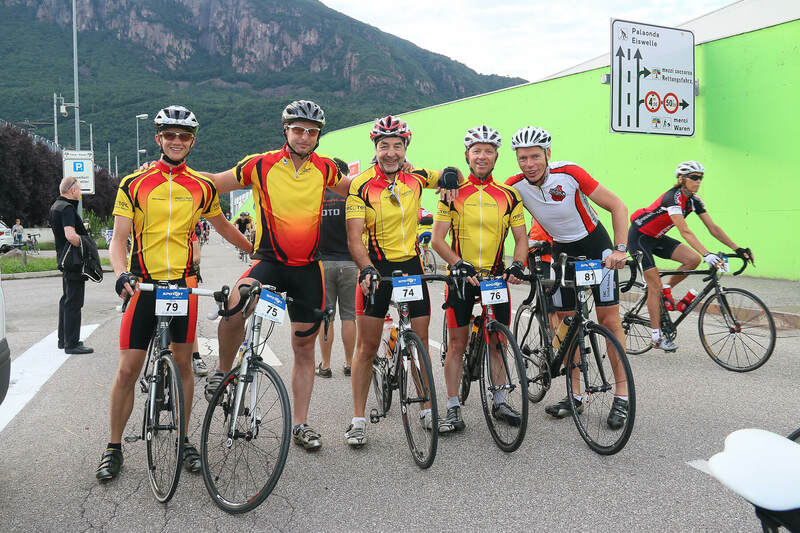 At the finish in Bolzano, there will be a drink party, to which also the accompanying relatives of the participants will be invited. With regard to the timed stretch, it is an ascent of 5,8 km, with various slopes (up to 18%), that requires an intense, even if short, effort. 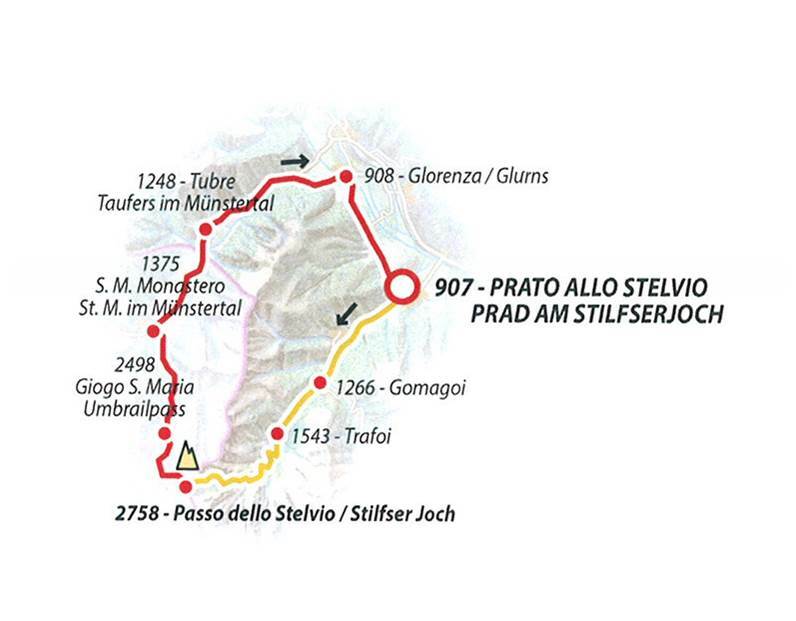 The stretch has a length of 24,8 km and a difference in height of 1851 m, with an average slope of 7,5% and peaks of 12-13%. Two timed stretches. 1) San Cipriano – Passo Nigra. Ascent with a length of 7,3 Km with an average slope of 7,7% and a difference in height of 618 m. In the first 4 km there are some very difficult stretches, with a slope that reaches a maximum of 20%; then, in the second half, the ascent becomes more regular with slopes between 6-10%. 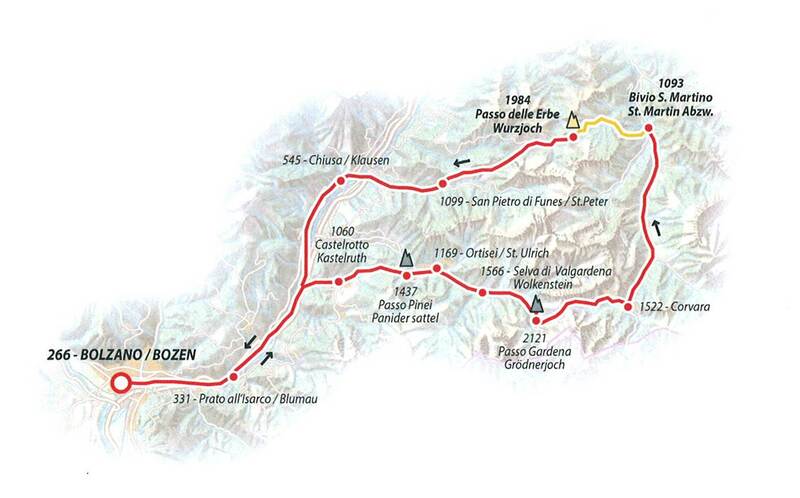 2) From Pozza di Fassa to Val San Nicolò: the ascent is 6,9 km long with a difference in height of 545 m; average slope of 8%. The ascent has a length of 10,7 km and a difference in height of more than 1000 m, with an average slope of about 10%. The ascent goes through a mostly woodland environment, without rest as far as the crossroads to Colle. From here the last stretch (1,5 km) is less demanding. The road is well-asphalted but narrow. Tiring are the first hairpin turns, that go to Costa. The ascent, 6,2 km long with a difference in height of 613 m, is short but demanding, because of slope, that in some stretches reaches 20%. The route goes through a very charming landscape, in the heart of Catinaccio. We find the most demanding slopes in the first 1500 m and in the final 3 km. The average slope is 9,9%. Recommended gears: 39/28. The ascent is one of the most known in the Dolomites, because of the landscapes that it offers. The final stretch, after the 7th km, has the most demanding slope (about 10%). There are two stretches, each 500 m long, separated by 1 km with a slope of 6%. This ascent is not to be underestimated. The timed stretch, from Santa Valburga to Fontana Bianca, is particularly long, but the first 12 km as far as Santa Geltrude are not so hard. 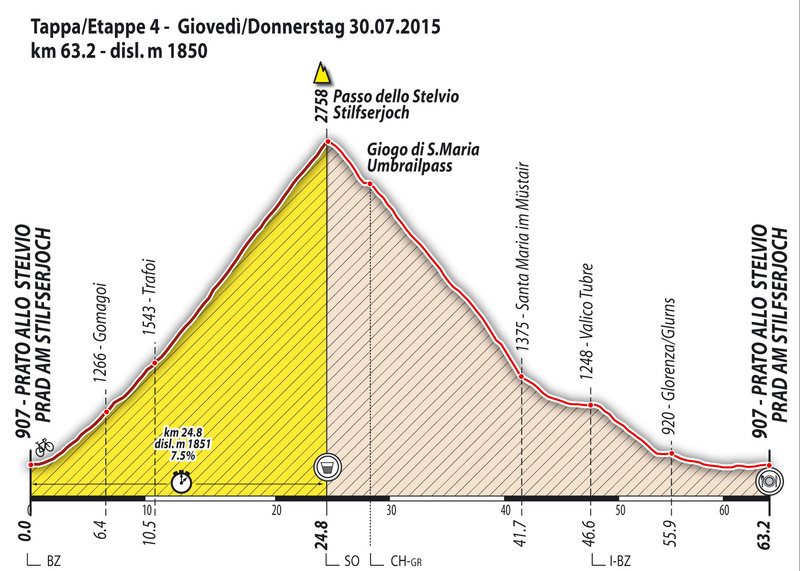 Difficulties start from Santa Geltrude on, because in the last 6 km a difference in height of 500 m will be covered. The road is narrow but in good condition. 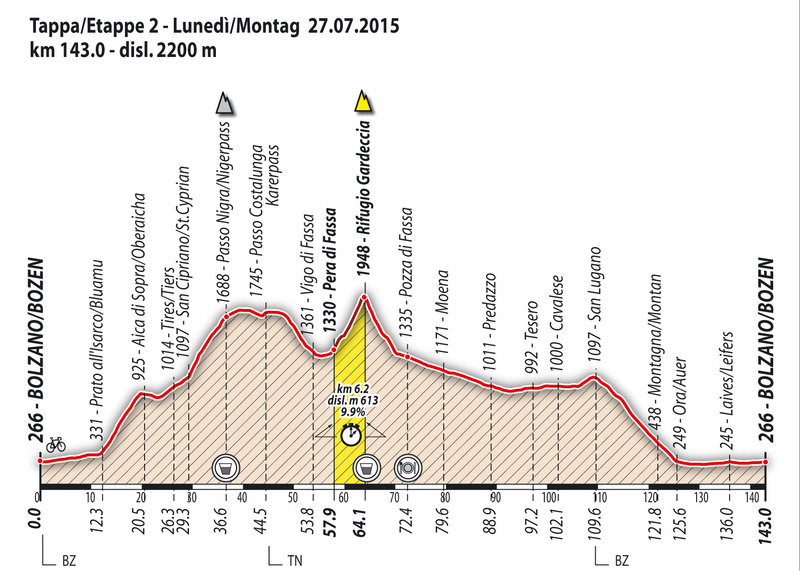 The average slope is about 10%, but in the first kilometers from Santa Geltrude the slope is about 12-13%. The ascent, well known and feared by our cyclists, is very short, but with prohibitive slopes. 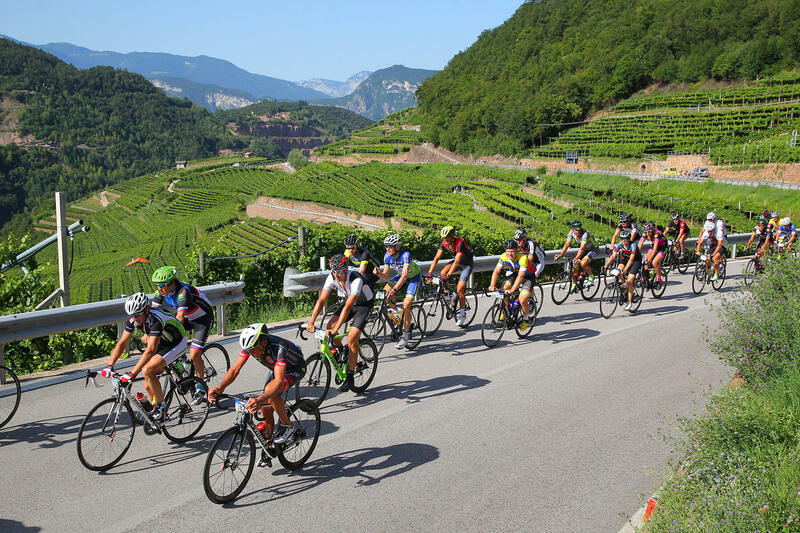 However the effort is rewarded at the finish, where it’s possible to enjoy a breathless view of the Caldaro lake and the surrounding vineyards. Slopes up to 12-13%.